See Pratheev Sreetharan present his work at our EmTech conference. Combining tools used to manufacture printed circuit boards with the spirit of origami, Pratheev ­Sreetharan has found a way to build tiny machines and complex objects that were previously impossible to fabricate without assembling them manually. Some of the results: a robotic bee created in a day, a tiny, precise icosahedron, and a small chain of interlocking carbon-fiber links. The small, intricate items demonstrate a fundamentally new fabrication approach that ­Sreetharan believes can be broadly applicable in making a range of new medical devices, robots, and components of analytical instruments. If Sreetharan is successful, he could open up the manufacturing no-man’s-land between the micrometer­-scale features of silicon chips and the centimeter-plus scale of everyday items. It’s a size range that’s of critical importance in biology and medicine. But today there’s simply no practical way to mass-produce three-­dimensional objects and complex machines on this in-between scale. Sreetharan’s prize creation is the robot bee, fabricated through a series of steps inspired by pop-up books. As a graduate student in the lab of Harvard microrobotics pioneer Robert Wood (a member of the 2008 TR35), Sreetharan was familiar with the task of laboriously gluing the miniature robots together under a microscope, and his fabrication approach was born of his determination to find a better way. He began by adapting standard lamination and micromachining techniques from circuit board manufacturing to carve the needed parts into a flat substrate. 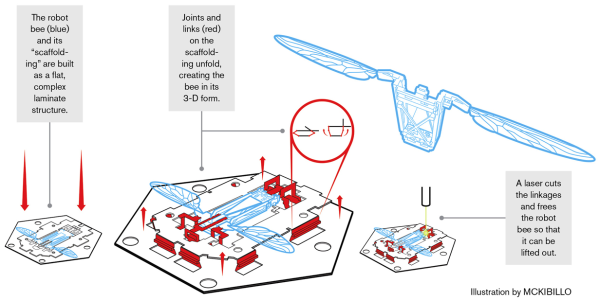 But the real trick came in adding features that allowed the parts to pop up and lock into place in one step, creating the bee. Sreetharan, who spent a recent summer in the Indian region of Tamil Nadu teaching Sri Lankan refugees about renewable energy and designing a solar-powered computer charger, recently got his PhD from Harvard and founded a startup called Vibrant Research in Cambridge, Massachusetts, to adapt his fabrication methods to advanced manufacturing. He is still deciding which specific products the company will focus on, but he says he is able to routinely make objects that have never before existed. And he hopes the novel production methods will create new opportunities in manufacturing. That would be a pretty good way to build on the buzz from his robot bee. I wonder if a pizeo-electric substrate would be possible and have interesting properties.I ran across an interesting presention on TED which demonstrated how complex a box can be.